Quest for the Teeth of the Upper Jaw’. the good Wizard Tobin in order to fulfill an ancient prophecy. prophecy join Squire. They also encounter many friends who assist them on the quest. whenever he uses it he will also get a glimpse of his own world,an unpleasant experience. quest, the wicked Wizard Gordeve tries to abduct Squire, destroy his friends, and thwart the quest. 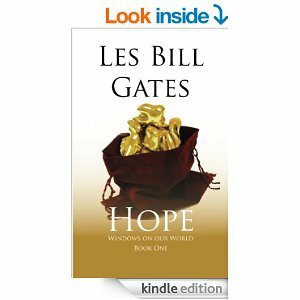 I found ‘Hope (Windows on Our Word) Book I’ by Les Bill Gates, to be a fantastic fantasy read. The author did a superb job in creating the characters. Each one is well-rounded and of full benefit to the unlikely group of characters sent on a quest. Les Bill Gates writes with great clarity and descriptions, which hold the reader spellbound. ‘Hope’ pulls the reader in and sends them down many lanes, with many twists and turns, keeping the reader on the edge of his, or her, seat. Of course, there is a prophecy that will keep readers looking forward to the next book, and the next in this trilogy. I recommend ‘Hope’ to fantasy lovers, young and old. I received a PDF copy of this book to read and give an honest review. I really enjoy book reviews Debra!